The author, a sufferer of tension-type headache (TTH), believes that the word "tension" in "tension-type headache" carries a social stigma and that patients do not accept a diagnosis of TTH readily. TTH is the most common primary headache disorder. The disability of TTH as a burden of society is greater than that of migraine. Absenteeism because of TTH is higher than that due to migraine. However, patients with TTH do not go for consultation. Even the prevalence of new daily persistent headache (NDPH) is 12 times higher at the headache clinic than that of chronic TTH (CTTH). These points hint that TTH patients probably do not want to visit the clinic. The author believes that it could be because of the stigma attached to "tension." Herein, the author has noted the first responses given by 50 consecutive patients with TTH when they were told that they had been suffering from TTH. The first answer of 64% of patients with TTH was "I do not have any tension/stress ." This denial is similar to the denial declared by patients with depression. Depression and tension are similar in the sense that both are considered as a signs of personal weakness. Such a preconception in the society creates a stigma, and patients deny the diagnosis, conceal symptoms, and become reluctant to seek help and treatment. The author, a neurologist and headache expert, suffers from tension-type headache (TTH). Whenever he gets an attack and shares with family members and colleagues (which include neurologists, headache experts, and psychiatrists) the fact that he is having tension headache, most of the time he gets stereotyped answers: "What tension do you have?" "Why do you feel so tense?" "Tension is not good for health." "Don't take much stress/tension." If the author says that he does not have any tension, they will not believe him and will ask him many questions. "If you don't have tension, why you get tension-headaches?" They start blaming the author's normal behaviors, attitude, working styles, hobbies, etc., as a reason for his tension headache. They imagine that the author does not handle stress well. The author almost never received any sympathy or empathy for his tension headache. Over the years, the author learned not to discuss his tension type headache with anyone. Does the same happen to others with TTH? Because of his personal experience (of the negative attitude of society), the author closely observes the emotion, psyche, or behavior of TTH patients. The author believes that the word "tension" in "tension-type headache" bears a stigma and that patients do not feel comfortable with the diagnosis. Herein, I have observed how patients reacted when we disclosed for the first time to patients that they had been suffering from tension headache. Fifty consecutive patients with TTH visiting the outpatient Neurology clinic were observed (from August 2014 to March 2015). We noted the first response the patients gave when we disclosed that they had TTH. 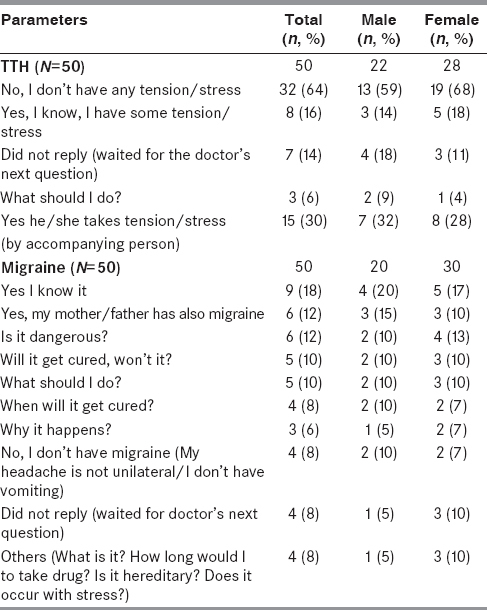 To make a comparison, we included 50 consecutive patients with migraine. Ethical permission was not required for such observations. Patients fulfilling the International Classification of Headache Disorders (3rd edition, beta version) (ICHD-3β) criteria for TTH and migraine were included. [Table 1] shows the first answer or response given by patients when we disclosed the diagnosis. The first reply of 32 Patients (64%) with TTH was 'I do not have any tension/stress.' Eight patients (16%) said, 'Yes I have some tension/stress'. Fourteen percentages (7 patients) did not reply anything and waited for the doctor's next question. Three patients (6%) asked, "What should I do?" Relative/friends of fifteen patients (30%) volunteered themselves and said "yes, he (or she) has tension". These all fifteen patients denied that they had any type of tension. Thus, there were only three different types of replies from the TTH patient group. Contrary to this, patients with migraine replied in many ways. There were at least 13 different types of responses [Table 1]. The first reply or reaction from the patients with TTH largely centered on "tension" (i.e., whether the patient had tension or not). The intention of the TTH patients was obvious: to not accept the diagnosis (or at least not to accept that they had mental tension). Stigma is a usual feature of psychiatric disorders, and more than 70% of people with depression do not seek attention. TTH because of the "tension" in its name simulates a psychiatric disorder. There is a popular belief that if you are a strong person then depression or tension simply cannot happen to you. A patient with depression often does not accept a diagnosis of depression. Just like depression, the society has a prejudice that if you are strong enough, you should not have tension (or TTH). Patients are blamed for their headaches and they do not receive any sympathy from others. Over the years, patients learn not to discuss headaches with anyone and even not to visit physicians. These patients do not want to be recognized as having tension or TTH and they do not accept the diagnosis readily. The author, to minimize the stigma of "tension," routinely explains to patients that the "tension" in "tension headache" is not related to mental tension, but that it is linked to muscle tension. This method works for some patients. However, a few patients find out that they are actually receiving antidepressants for their muscle-tension headache. This again creates some problems. They may not wish to visit any physician and will prefer to use only over-the-counter (OTC) products. A recent review showed that the disability of TTH as a burden of society is greater than that of migraine. Absenteeism because of TTH is greater than that due to migraine. However, when it comes to visiting the headache clinic, these sufferers do not come out from their homes. In a clinic-based study, 87% (adults) of the chronic daily headache cases seen were transformed migraine and only 0.9% were chronic TTH (CTTH). Surprisingly, new daily persistent headache (NDPH) cases were 12 times more common than CTTH (10.8% vs 0.9%). There is no comparison between the prevalence of CTTH and the prevalence of NDPH (2% vs 0.03%). But NDPH patients visit clinics, while CTTH patients avoid them. Headache experts should think about why such patients avoid visiting a clinic. Is it because patients with CTTH have received a diagnosis of tension headache in the past and, because of the negative attitudes and beliefs of society about TTH, they prefer not to visit clinics, even if their condition becomes severe and chronic? Lonardi suggested that chronic headaches as a whole may carry stigma because of the invisible nature of the disease (that is, invisible to others and known only by the owner). In this regard, TTH is more invisible, as the visible components of migraine and other types of headache (vomiting, cranial autonomic features, and auras) are not part of TTH. Therefore, the invisibility of TTH makes the sufferer more susceptible to feeling stigma. Headache is already a topic neglected by the medical fraternity for various reasons. Stigmatizing the most common headache disorder may further complicate the issue. Patients will not accept the diagnoses and they will keep their problems to themselves. Patients will become reluctant to seek help and treatment. There is a need to study this issue prospectively. The study may start from the first day of the diagnosis. The study should also be done in follow-up to find out the behavior of society on getting an attack of TTH. Surveys can be conducted even among the general population about the knowledge, attitude, and beliefs about TTH. Stigma may vary with cultural differences, education level, and many other things. So there is a need to look for even these variables. This is the author's small step toward finding out whether patients with TTH feel stigmatized or not. It is hoped that this will inspire others to find out the reality of the situation. Ablon J. The nature of stigma and medical conditions. Epilepsy Behav 2002;3:2-9. Chapple A, Ziebland S, McPherson A. Stigma, shame, and blame experienced by patients with lung cancer: Qualitative study. BMJ 2004;328:1470. Walker C. The stigma of depression: History and context. In: Walker C, editor. Depression and Globalization: The Politics of Mental Health in the 21 st Century. 1 st ed. New York: Springer-Verlag; 2008. p. 31-57. Bendtsen L, Evers S, Linde M, Mitsikostas DD, Sandrini G, Schoenen J; EFNS. EFNS guideline on the treatment of tension-type headache - Report of an EFNS task force. Eur J Neurol 2010;17:1318-25. Bigal ME, Lipton RB, Tepper SJ, Rapoport AM, Sheftell FD. Primary chronic daily headache and its subtypes in adolescents and adults. Neurology 2004;63:843-7. Lonardi C. The passing dilemma in socially invisible diseases: Narratives on chronic headache. Soc Sci Med 2007;65:1619-29.